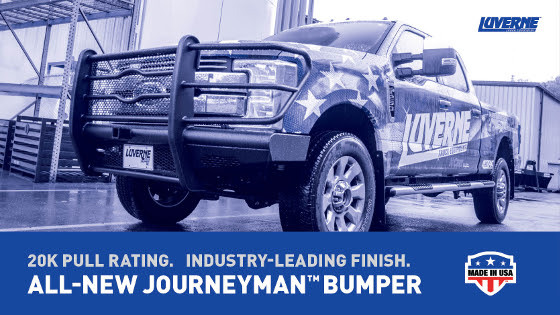 The LUVERNE Journeyman™ bumper is one of the toughest, hardest-working replacement bumpers in the truck accessories market. It is equipped with a 20K straight-line pull rating, a 2″ receiver tube, a unique dual-layer finish and a highly protective punched steel screen with our signature logo reveal. With its one-piece, all-steel construction, the Journeyman™ offers dependable strength on the front end of your truck, whether you’re a tradesman, farmer, backwoodsman or industrial man. Best of all, each Journeyman™ bumper is made and tested right here in the USA for safety you can count on. Stop by our exciting booth #34017 to see all of the CURT Group brands united in one space. We will be showcasing several exciting new products from each of our brands, including CURT, ARIES, LUVERNE Truck Equipment and UWS.